Added by thronn on September 11, 2014. Bassist Louiche Mayorga decided to form Luicidal with his former Suicidal Tendencies bandmate R.J. Herrera after he missed “being on the stage as an artist”. In order to put the band together, they were joined by Mando Ochoa (Sick Sense) on vocals and Ricky Reynaga (Rated X, Rolling Papers and Sancho’s Revenge) on guitar. At their shows, Luicidal performs songs from Suicidal Tendencies’ first three studio albums, Suicidal Tendencies, Join the Army and How Will I Laugh Tomorrow When I Can’t Even Smile Today; the first two featured Mayorga on bass, while the last two featured Herrera on drums. Luicidal will release their debut album Luicidal on October 14, 2014 on DC-Jam Records. 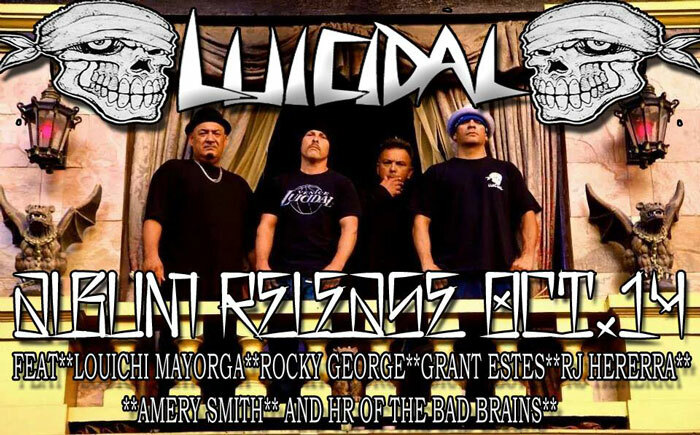 Mayorga has described the musical direction as “badass like the 80’s style Suicidal music.” Luicidal will feature guest appearances by former Suicidal Tendencies members Rocky George, Grant Estes and Amery Smith as well as H.R. of the Bad Brains and Dale Henderson of Beowülf.